From the Blue Ridge Mountains to Smith Mountain Lake, Bedford County is a celebration of history and natural wonder. Nestled in the midst of mountains, rolling hills and pastureland, Bedford charms visitors with its natural beauty, history, and respite from the hustle and bustle. The twin Peaks of Otter rise to an elevation of 4,200 feet and provide a majestic and iconic landmark. 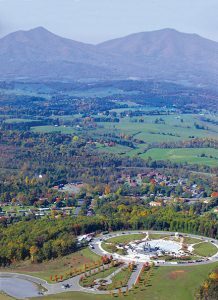 Historically, Bedford County was an agricultural economy, and while agriculture is still an important factor, the county now has a wide range of industries from nuclear energy to wireless communications. 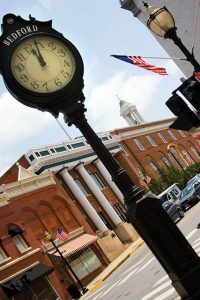 The county has been designated one of Virginia’s Technology Zones, and the Town of Bedford is a Virginia Enterprise Zone. Hotels and restaurants provide appealing accommodations to visitors. The Bedford County Public School system has a mission of “Empowering learners for future success.” Personalized learning is emphasized, and students participate in internships, work-based training, and community service projects. Bedford County has 13 elementary schools, three middles schools, and three high schools. The Bedford Science and Technology Center provides workforce training to high school students. Tourism is important to the economy as visitors from all over the world travel to the area. The National D-Day Memorial draws 60,000 visitors a year who come to commemorate the valor, fidelity, and sacrifices of the Allied Armed Forces who landed in Normandy, France during World War II. The Blue Ridge Parkway is enjoying record visitation, particularly during the fall foliage season. The Beale Treasure, a legendary cache of gold, silver, and jewels, attracts numerous treasure hunters. Apple and peach orchards dot the mountain landscape and provide opportunities for visitors to pick their own fruit or buy it already packed. Johnson’s Orchards is a sixth-generation family owned and operated farm located at the foot of the Peaks of Otter. For several years, the farm has been the setting for crews filming the Beale Treasure story. These include Unsolved Mysteries in 1987, the BBC in 1999, Fox in 2000, the Travel Channel in 2002, and a Korean film crew in 2003. The farm is also home to the Peaks of Otter Winery, which produces approximately 30 varieties of native fruit wines. The farm and the winery give tours and hold special events throughout the year, including the Horse and Hound Wine Festival. 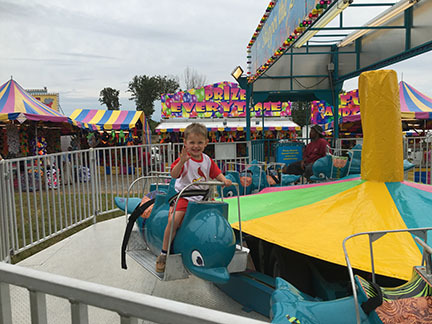 The Town of Bedford’s Centerfest is a weekend of arts and crafts, food, and entertainment in Bedford’s Centertown. The Peaks of Otter dominate the skyline above the town of Bedford and the D-Day Memorial. Poplar Forest, Thomas Jefferson’s Bedford County retreat home, stands as a testimonial to Jefferson’s creativity and architectural genius. Archaeological excavations are ongoing at Poplar Forest in an effort to restore the plantation home and grounds to their Jefferson-era appearance. The home is open for tours April through November. The Town of Bedford’s heritage (founded in 1784) is preserved in a number of historical sites. Historic Avenel, an 1830’s manor house said to harbor a ghost, and the Bedford Historic Meeting House, a church building erected in 1838, are just two of the 218 contributing structures that have placed the town of Bedford on the National Register of Historic Places. The Bedford Museum and Genealogical Library traces Bedford’s history from early Native American times up through the mid-20th century. The city’s historic cemetery, Longwood Cemetery, is the site of burials as far back as the Revolutionary War. 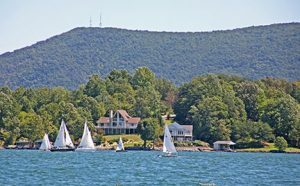 Smith Mountain Lake, Virginia’s largest man-made lake, provides unlimited water sports, as well as golf, horseback riding, hiking, shopping and dining. Smith Mountain Lake State Park has a sandy beach for swimmers and sunbathers and provides easy access for visitors who wish to launch boats, camp, or picnic by the water. Liberty Lake Park serves as the recreation center for the Bedford area. 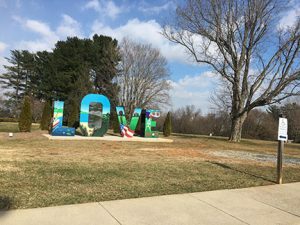 The 60-acre park offers, baseball and softball fields, basketball, racquetball, tennis, and volleyball courts, roller-skating and walking loops, picnic facilities, and an award-winning handicap hiking trail. Mountain hiking, biking, picnicking, and photography are available all along the Blue Ridge Parkway. Bedford is known as the Christmas Capital of Virginia for the spectacular Christmas light display at the English Meadows Elks Home, a senior living facility. A 62-year old tradition, the display is arranged along the long entrance driveway and around the circle in front of the home’s grand entrance. Liberty Lake Park also has an impressive show of Christmas light displays positioned throughout the park.